I created this group of premium video lessons to provide a good foundation for anyone beginning to learn to play mandolin. The 12 lessons in this series total to over 4 hours of video instruction, 25 MP3 practice audio tracks, and 30 pages of tablature, notation, chord charts and tips. You can purchase them individually or use the "add to cart" function to grab several at once. The entire series is lower in cost than a couple of private lessons and you can watch the videos, print out the tablature, and play the MP3 tracks as many times as you need to practice and learn. They can easily be purchased using your phone, iPad, etc. but you should use your desktop or laptop computer to download the files. Once you have them on your computer you can transfer them to other devices. Study the lessons one at a time at your own pace. This is not a subscription and there is no recurring billing. Transactions are processed through PayPal which accepts credit or debit cards or your PayPal balance. To help you keep track of your progress I have prepared a Lesson Checklist (which includes the free lessons I suggest that you watch). Click here to download it free. is a downloadable video mandolin lesson that teaches you the essential beginning skills you'll need to play the mandolin. In the video I explain the basics of reading tab, teach you some basic picking patterns, show you how to play some easy left hand notes and put it all together in a complete song. The download includes 17:32 minute video lesson, 4 MP3 practice tracks and a 3 page PDF file with the tab and standard notation for the lesson. To read what other students say about my lessons click here. is a downloadable video mandolin lesson that builds on the concepts and techniques taught in Beginning Mandolin 1. In this lesson I explain the basics of harmony doublestops, teach you how to transpose a song from the key of D to the key of A, and teach you what a "lick" is and how they can be used. The download includes the 19:01 min. video, 2 MP3 practice tracks and a 4 page PDF file with the tab and standard notation for the lesson. is a downloadable video mandolin lesson that explains how to play quarter notes and 8th notes using tablature, provides helpful detail on left hand technique and provides a speed-building section which will benefit any beginner. You will learn a basic version of the bluegrass jam session favorite, Boil 'Em Cabbage Down, and then a slightly more intricate variation of the same tune. The download includes 14:35 minute video lesson, 3 MP3 practice tracks and a 2 page PDF file with the tab and standard notation for the lesson. is a downloadable video mandolin lesson which teaches 13 mandolin chords and gives you the opportunity to practice your rhythm playing by "slow jamming" on 3 popular bluegrass songs: 9 Pound Hammer, Salty Dog and Bury Me Beneath The Willow. On-screen chord captions make it easy to play along with the video. In this lesson I will show you easy two-finger and bluegrass "chop style" chords for each song. The download includes 27:04 minute video lesson, 3 MP3 practice tracks and a 4 page PDF file with the tab and standard notation for the lesson. If you only buy one video lesson (I hope you'll get a few more, of course.) THIS IS THE ONE if you are strapped for cash or just can't decide. This one will get you playing! I'll eat my hat if it doesn't! (Hat of my choosing.) At least you'll show up for a jam session and they'll say "what do you want to play?" and you'll say "Oh, howsabout Nine Pound Hammer?" And you are off and runnin'. is a downloadable video mandolin lesson that teaches you the essential chord formation skills you'll need to play the mandolin. You will learn how to play all 12 major and all 12 minor chords using just 4 basic forms. You'll also pick up a little bit of vital music theory information along the way. The download includes 14:43 minute video lesson and a 2 page PDF file with the chord charts for the lesson. is a downloadable video mandolin lesson that teaches you 4 useful barre chord shapes that can be moved up and down the neck. These compact forms are great for anyone with small hands or if you are having trouble with the Monroe style "chop chords" You will learn how to play the dominant 7th, the major 7th and the minor 7th chords which are great sounding chords. Armed with these fun chords you'll be fully prepared to play along with bluegrass, jazz or blues songs. The download includes 18:16 minute video lesson, 3 MP3 practice tracks and a PDF file with chord charts for the lesson. is a downloadable video mandolin lesson that teaches you how to play the centuries old tune Greensleeves two different ways. First, you will learn to play it as a waltz in 3/4 time. Then, you'll learn about 6/8 time by learning to play it as a jig. The download includes 16:50 minute video lesson, 2 MP3 rhythm practice tracks and a 2 page PDF file with the tab and notation for the lesson. by Bradley Laird, is a downloadable video mandolin lesson that teaches you how to play the popular bluegrass and old-time jamming tune Cripple Creek. This lesson teaches 3 complete versions of the song, each one a little more more advanced. The first version is a basic break for beginners. The second version includes some embellishments like slides and doublestop harmony. The final version is a "simulated" improvisational solo which is a good introduction to learning how to make up your own solos to this and many other tunes. The lesson wraps up with a hot bluegrass ending lick that you can use for any song in the key of A. The download includes 20:53 minute video lesson, 3 MP3 practice tracks and a PDF file with the tab and standard notation for the lesson. If you are stuggling for form those BIG chop chords, or have uncooperative or small hands, you should explore this lesson. You'll learn several compact chord forms which can be used to get that percussive chop mandolin sound and they can be moved all over the neck to form every major and minor chord. This lesson also reveals the navigational secret that usually takes about 15 years for the average player to stumble upon. Save yourself lots of trouble and let me show you the ropes. The download includes the 31:19 minute video lesson and a 5 page PDF file full of chord charts, tables and tips. This is one of my longer video lessons so be sure to be patient for the download to complete. This video lesson teaches you how to apply doublestop harmony to your mandolin solo lines. My earlier beginner lessons show you how to play some doublestops and this explains them more fully so you can find them and apply them to other tunes on your own. Multiple ways of choosing the harmonizing note are discussed and you'll learn some useful "turnaround" licks in the process. This lesson is the first in a two part series. The second lesson is called Exploring Doublestops 2. The download includes 21:10 minute video lesson and a PDF file with the tablature and standard notation for the lesson. This downloadable video mandolin lesson teaches more ways to find and use doublestops. After learning a basic series of two-note positions, created using notes of a G scale, you'll learn how to use them with other chords. This lesson also teaches a sample solo to help you absorb some of the ways to apply doublestops in "the real world." This lesson is a continuation of the lesson called Exploring Doublestops 1. The download includes 23:28 minute video lesson, an MP3 practice track and a PDF file with the tablature and standard notation for the lesson. 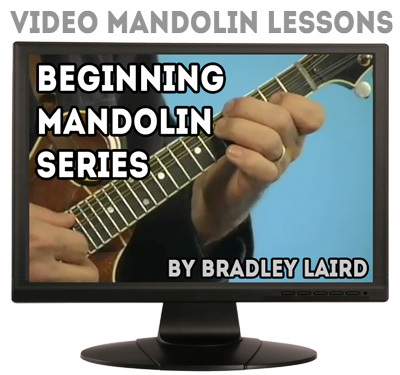 This lesson by Bradley Laird, is a downloadable video mandolin lesson that teaches you how to play the jam session favorite "Sally Gooden" in the key of A. You'll learn four complete versions of the tune. This is an excellent lesson for beginners who can play a few basic tunes and would like to expand their skills, stash of licks, and increase speed. Once you learn the basic version, the lesson teaches a variety of ways to embellish the tune using pentatonics, unison doublestops, blues notes, slides and some up-the-neck licks. The download includes the 24:20 minute video lesson, 2 MP3 practice tracks (2 speeds) and a PDF file with the tab and standard notation for the lesson. These video mandolin lessons have taught thousands of people to play because they really work! Try them and see for yourself.